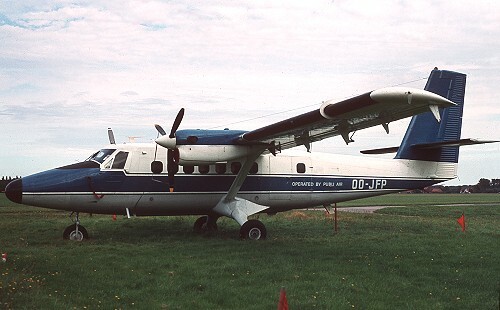 Description: this second hand Twin Otter for Publi-air was registered on February 22 1973 and arrived a bit later at Brussels on March 10. It was immediate operating for Sabena in their full (old) colors with additional small "Common Market Commuter" titles. During the early eighties it was laid up for a while and exported to Zaïre on March 10 1981, leaving Brussels on the 24th of the same month. 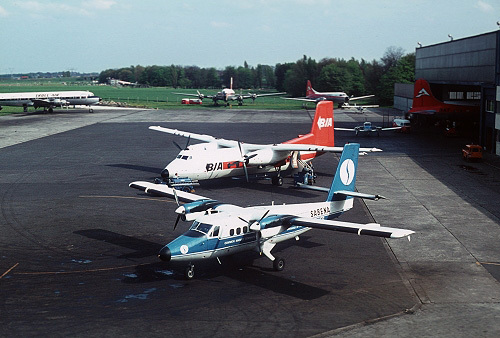 Description: beautifull scenery taken from the control tower with no less then 6 different commercial airframes: in the foreground the Twin Otter, behind an Handley Page Herald of BIA (a regular visitor on the London run), in the hangar a cargo DC4 of DAT, behind from right to left a Convair 440 of DAT, a DC6 of DAT (still in Kar-Air markings which was used for spares only), another DC6 of DAT (still in Troll-Air markings) and in the far back an abandonned DC3 of DAT used as a bar by a soccer club. Description: stored in basic (old) Sabena c/s with only "operated by Publi-Air" titles.